The African Grey is primarily ... grey. There is a white area around the eye, and a red tail. There are two types of Greys, the normal African Grey and the Timneh race. The Timneh race has a dull red tail. There is a third type of African Grey. Although there are only two scientifically recognized subspecies, the Congo and Timneh; Importers and quarantine stations have discovered two other AGs that come from different regions and have distinctive differences. The first is the Camaroon, which comes from Zaire (they were exported by an exporter in Camaroon) , is approx. 20% larger, has a more silver appearance, larger squarer head, and a brighter crimson tail than the congo. The second is the "Ghana", from Ghana, not Guyana located in Central America. The Ghana is smaller than the Congo and similar to the Timneh but has a much longer neck. The male african grey has a flatter, broader head and is generally one inch bigger in size that the female. The female has a longer, more slender neck and a smaller rounded head than the male. The female also has a more eliptical shape to the eye, whereas the male's is more round. 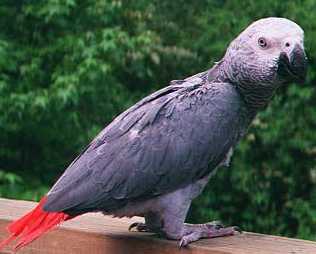 The male Congo african gray parrot usually is darker on the wings and has red feathers around the vent. Known as the best parrot at mimicry. Studies have shown that the Grey can actually understand and use human language. Greys can be very tempremental, and are known to be nippy. They have a tendency to pluck feathers if bored. And the bird tends to bond to one person.